As in 2017, MLBUmpireObserver takes a look at the Triple-A call-up umpire slate at the 2018 All-Star Break and, alongside Russ's stats, puts together a scouting report from the up-and-down farm that is the Minor League fill-in roster. Umpires are ranked by how many games they have worked in 2018, Opening Day through the mid-July All-Star Break. Nic Lentz has worked the most in 2018. MLUO: He has worked in the big leagues almost all year. I expect him to be either 3rd or 4th to be hired. MLUO: I believe he will be full time next year. The only thing I worry about is that he has been passed over a few times by the league. MLUO: The league is high on him with almost a semi-permanent assignment on Gorman’s crew. I expect him to be 3rd in line to get hired this offseason but he and Lentz are really close to each other. MLUO: He has worked with Holbrook’s crew almost the entire season. He reminds me of Scheurwater last year with a semi-permanent crew assignment. I think he is the next umpire to be hired Full time. MLUO: He has been up most of the year which is a good sign for him. MLUO: Look for him to keep getting more games, and possibly jump to the top of the list at this point next year. He has the look of a MLB umpire out on the field. MLUO: I expect him to not get hired this offseason but looking positive for 2020. MLUO: I feel the league could go either way on him. He has seen some action this year and he will be back next year but I think it will take a lot of turnover to get him a job. MLUO: I still don’t know where the league will go with him. He could easily go either way. MLUO: I almost forgot about Jansen because he has had such a quiet year this year despite getting some very favorable assignments as a rookie. He has a bright outlook in the next few years. MLUO: I at one point thought he would be a front runner for this upcoming offseason but he has obviously falling from number one as he only has 20 some games at the all star break. MLUO: I feel like we will need to see more of him next season to figure out how MLB will react to him. MLUO: Very slow start to the year but has picked up. Hopefully he isn’t hurt by the Donnie Baseball curse but I fear he has been. MLUO: I expected him to get more games as he was made a rover this season, but the league hasn’t used him very much but I think after this year and a few retirements he will get a look next season. MLUO: I thought he was on the outside looking in after having 3 calls overturned in a game last year but has gotten some work lately. Gil's Take: When MLUO put together this year's list, the names were tiered without regard to the number of games each umpire has worked thus far in 2018. 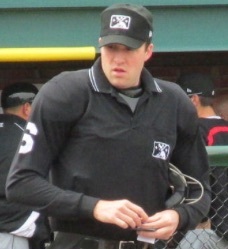 Suffice it to say, MLUO's four tiers are accurately reflected in the number of games each call-up has received thus far this season: Segal as the most experienced umpire on the list appears to have the most promise, alongside Whitson, Blakney, and Lentz, followed by Tier 2, whose members have gotten a healthy dose of work thus far. It is notable that both rookies (Rehak and Visconti) have gotten significant work this year, which bodes well for both as long as they continue to impress at the MLB level. Some of Rehak's situation handling, in particular, has been quite impressive for a newcomer to the big leagues. On the flip side, we have Additon, Livensparger, and Libka in MLB's proverbial hot seat, with Libka perhaps the umpire who has the greatest opportunity for growth due to how few games he has officiated in the majors, compared to the others. Yes, he had three calls overturned in a game, but if that was the only criterion for MLB work, there might well be a few veteran full-timers out of a job right now. In all, an umpire likely needs at least 50 games at the major league level before a more substantial opinion can form; the only question is with such talent waiting to surface, will there be enough time? As far as "time's running out" is concerned, just Barber, May, Segal, Whitson, and Woodring are on call-up year #5 (Blakney's on year #4). In the end, it might very well depend on retirements at the full-time level: this year has produced many MiLB opportunities to work MLB games due to various injuries and surgeries, so it will be interesting to see how that carries over year-to-year. If it translates to retirements, that means more time for everyone and, obviously, a greater number of hires over the winter. *Segal and May have both worked a suspended game not yet completed, which is not accounted for in the above number of games officiated thus far in 2018.